Every registered dealer is required to file GSTR-1 every month. The return contains details of all outward supplies made during the month.However, certain taxpayers having annual turnover upto Rs 1.5 crores can opt to file the GSTR-1 once in every quarter. Upload sales details at a click of a button. No need to login to GST Portal. Autofill HSN wise summary based on sales details imported by you. There are 2 options that a return filer has here – Prepare the return online or offline. Let us take a look at the process of preparing the return online first. Click on Prepare online. 1. Aggregate Turnover of previous Finacial Year. For the returns of July 2017 to March 2017, Financial Year means 1st April 2016 to 31st March 2017. 2. Aggregate Turnover for April 2017 to June 2017. Below is the summary of all the Tables where details of outward supplies need to be entered. We will take up each tile one by one. All B2B Invoice details are required to be entered inside this tile. Step 1 – Click on the 4A, 4B, 4C, 6B, 6C – B2B Invoices tile. Select the check box for Deemed Exports, SEZ Supplies with Payment or SEZ Supplies Without Payment, if applicable. Enter the receivers GSTIN/ UIN . Once this is done the Receivers Name, POS and Supply Type will be auto populated. In case the supply attracts reverse charge or supply is through e-commerce operator select the check box. 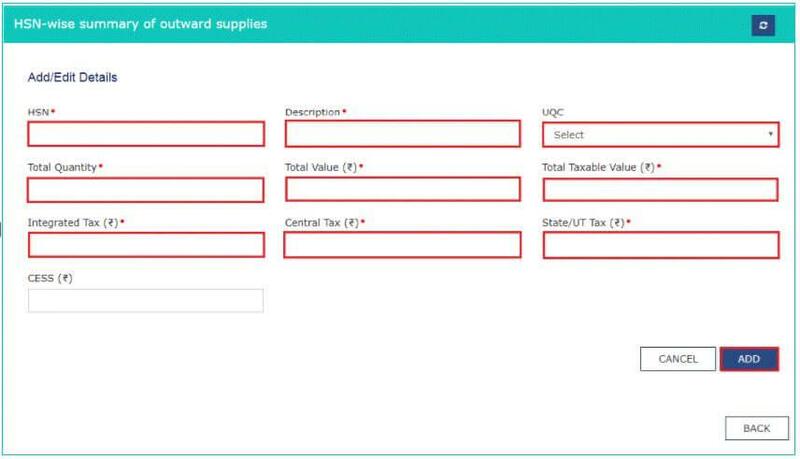 Enter the Taxable Value of supplies made in the taxable value field. Based on inter-state or intra-state transactions CGST and SGST or IGST will appear in the amount of tax field. The Amount of tax is auto calculated based on the taxable value entered. Click on Save once all the details are entered. Step 4 – You will be redirected to a page where you can see the summary of all the invoices entered. You can edit/delete invoices here (under Actions). Step 5 – Click the BACK button to go back to the Invoices – Receiver-Wise-Summary page. You can add invoice of a particular receiver by clicking on a receiver details and clicking on add invoice button at the bottom of the page. 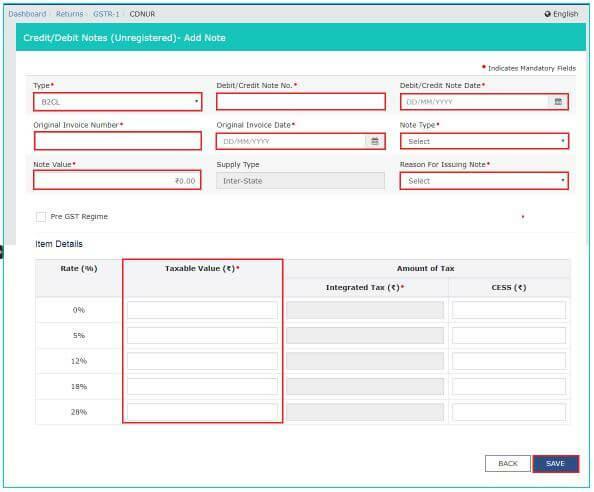 Step 6 – Click on Back button to go back to GSTR-1 page. 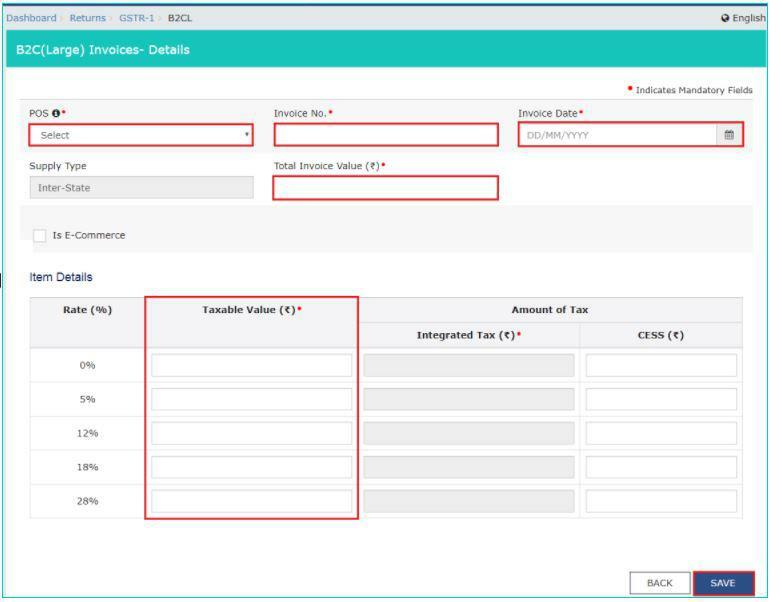 You will see that the B2B Invoices tile in GSTR-1 reflects the number of invoices added along with Total Invoice value, Total taxable value, and total tax liability. All outward supplies made to a consumer and the invoice value is more than Rs 2.5 lakh has to be entered in this tile. 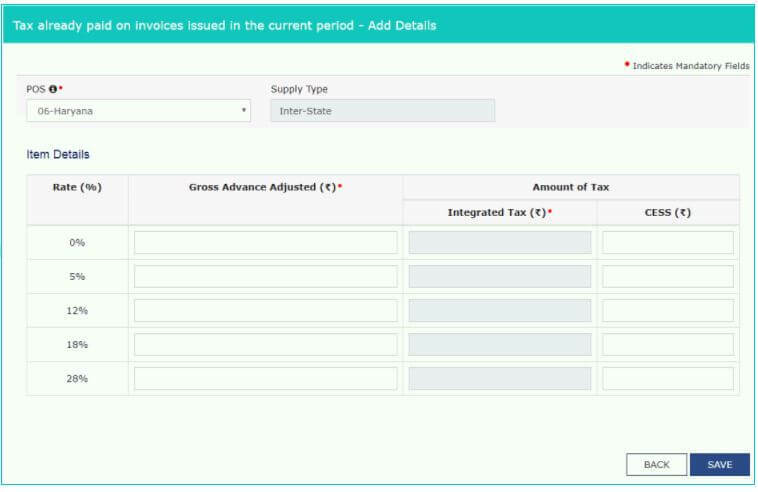 Step 1 – Click on the 5A, 5B – B2C (Large) Invoices tile. Step 2 – You will see a summary of the B2C (Large) Invoices. Click on Add Invoice to add a new invoice. In the POS field select the state where the goods are delivered in the drop down. The supply type will be auto-populated based on this. Enter the Invoice No., Invoice Date, Total Invoice Value. In case the supply is made through e-commerce operator tick the checkbox ‘Is E-commerce’. Enter the Taxable Value of supplies made in the taxable value field. Based on inter-state or intra-state transactions CGST and SGST or IGST will appear in the amount of tax field. The Amount of tax is auto-calculated based on the taxable value entered. Click on Save once the details are entered. Step 5 – Click on Back button to go back to GSTR-1 page. 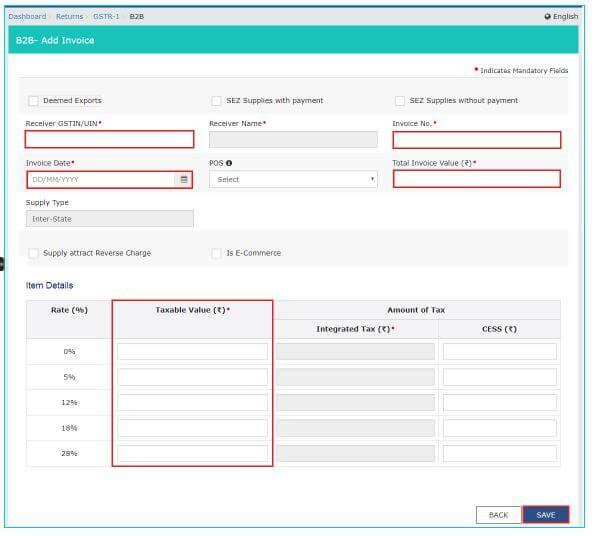 You will see that the B2B Invoices tile in GSTR-1 reflects the number of invoices added along with Total Invoice value, Total taxable value, and total tax liability. As the heading suggests this tile is to add the Credit and Debit Note issued to registered dealers. Step 1 – Click on the 9B – Credit / Debit Notes (Registered) tile. Step 2 – On the summary page click on Add Details to add Credit or Debit Note. Enter the Receivers GSTIN. The name will get auto populated. Enter the Debit/ Credit Note no. and Date. In the Original Invoice No. and Date field enter the date and number of the invoice against which the debit note or credit note is issued. In the Note Type drop down select whether the details added are for a debit note, credit note or refund voucher. Enter the Note Value and the Reason for Issuing Note. If the original invoice was issued before 1st July 2017 tick on the check box Pre- GST Regime. Enter the Taxable Value of goods or services in the taxable value field. Based on inter-state or intra-state transactions CGST and SGST or IGST will appear in the amount of tax field. The Amount of tax is auto calculated based on the taxable value entered. Step 4 – Click on back button to go back to GSTR-1 page. You will see the summary of all the debit notes/ credit notes/ refund vouchers added. This tile is to add the Credit and Debit Note issued to unregistered dealers. Step 1 – Click on the Credit / Debit Notes (Unregistered) tile. Choose the right type from the drop down like B2CL, export without payment, etc. Enter the Note Value and the Reason for Issue of Note. Step 4 – You can see the summary of all the debit notes/ credit notes/ refund vouchers issued to unregistered dealer added here. Invoices for supplies exported has to be added in this section. 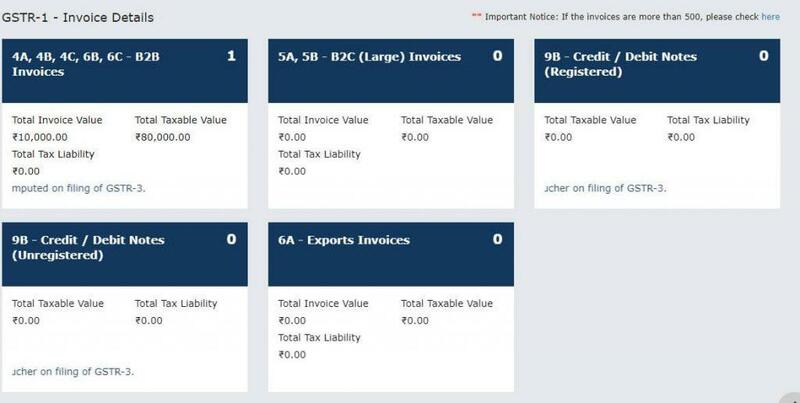 Step 1 – Click on the 6A – Exports Invoices tile. 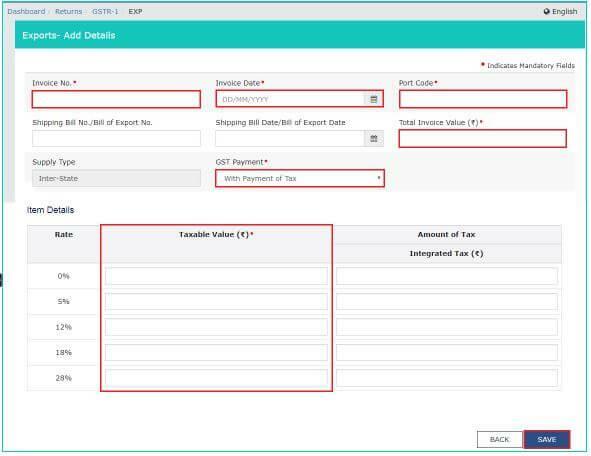 Step 2 – On the summary page click on Add Details to add invoice of exports. In the GST Payment select from the dropdown if GST is paid or not. Step 4 -Click on back button to go back to GSTR-1 page. You wil see the summary of all the Export Invoices added. All supplies that are B2C and the amount is less than Rs 2.5 lakh, the details of those invoices have to be entered here. Step 1 – Click on the 7- B2C Others tile. Step 2 -Select E-commerce tab to add details for a transaction through E-commerce or else select Other than E-commerce tab in case transaction is through non E-commerce. Click on Add Details button on the bottom right. Step 4 -Click on back button to go back to GSTR-1 page. You can see the summary of B2C others invoices here. All supplies made which attract nill rate of GST should be entered in this tile. Step 2 -Click on edit to make the fields editable. Step 4 – Click on save and a success message will be displayed on top. Step 5 -Click on back button to go back to GSTR-1 page. You can see the summary of all nil rated supplies made. All the supplies for which advances were received from the receiver of supplies but invoice was not raised will be entered here. Step 2 -Click on Add Details button on the bottom right. Step 4 -Click on back button to go back to GSTR-1 page. You can see the summary of adjustment of advances. Step 2 – Click on Add Details button on the bottom right. Step 4 – Click on back button to go back to GSTR-1 page. Here you can see the summary of adjustment of advances. 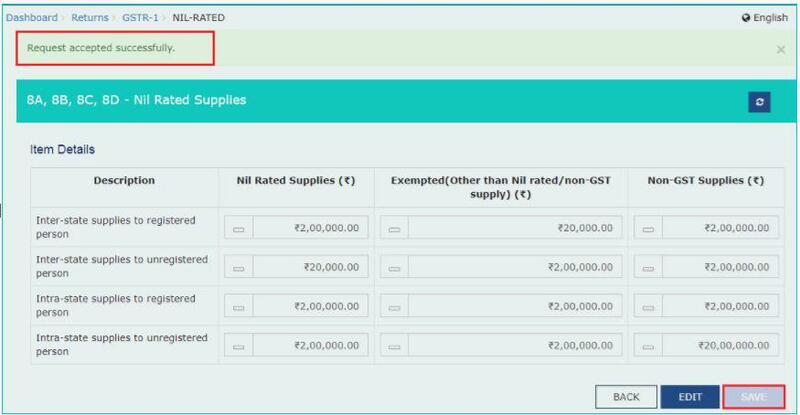 The GSTR-1 return requires a dealer to provide HSN-wise summary of outward supplies and rate wise along with quantitative details. Step 1 – Click the HSN-wise summary of outward supplies tile. Step 2 – Click on Add Details button on bottom right. In the ‘UQC’ drop-down select the quantity of the supplies. Eg – KGs, Liters, etc. Click on Add and on the next page click on save button. Step 4 – Click on back button to go back to GSTR-1 page. Here you can see the summary of HSN-wise outward supplies. Every taxpayer is required to provide details of the total document issued during a month. Step 3 – There are will be 12 categories of documents. Enter the serial no. of invoice issued, Total number of invoices issued and cancelled invoices in respective fields. The net invoices field will be auto populated. Step 4 – Click on save once all the documents details are entered. Once all the details have been entered the return needs a declaration and can be submitted online. 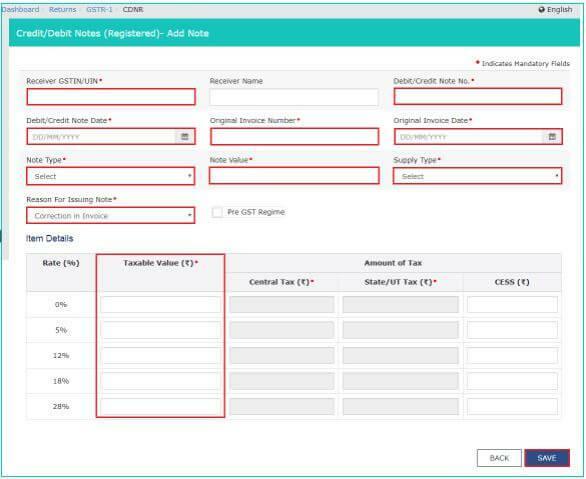 ClearTax GST software can also be used to file GSTR-1. Its simple and easy.